Terry McAuliffe, Democrat Governor of Virginia, USA, has a difficult decision to make. He has promised a change in Virginia school textbooks—to include “East Sea” as a name for the Sea of Japan. McAuliffe has recently backed away from this pledge, but rival Republican legislators are pressing the governor on the issue. This name change, meant to satisfy a community (Korean-Americans) increasingly important to Virginia politics, has angered one of the state’s major trading partners, Japan (Vozella 2014). Place names dot our maps and our imaginations on a daily basis. They are essential components to place-making and work as mnemonic devices in creating place and group identity. As such, place names, or toponyms, are inherently political and often contentious—as the East Sea/Sea of Japan example illustrates. Recent critical literature on toponymic change has focused on the role of government elites in controlling place names, but little has been written until recently about the role of companies and private financial interests in the naming process. Using an example from Ohio, USA, we show in an Area paper how toponyms change over time and how these changes become socially charged debates over identity, nationalism, and economic development. This particular project looks at how New Berlin, Ohio, changed its name to North Canton. On the surface, this change looks relatively simple—wartime nationalism spurred the change from a name reflective of the area’s German ancestry to one that identified the village’s nearest major city. In New Berlin, however, national and global economics also played a large role in this sudden name change. More specifically, we discuss the influence that two related New Berlin corporations—the W.H. Hoover and Hoover Suction Sweeper companies—had on renaming New Berlin through their initiation and support of a public petition to change the name. Our analysis of this change focuses on three distinct forms: place re-branding, the “fetishization,” and symbolic annihilation of local Germanic identity, and the impact of regional and international economics on the local landscape. 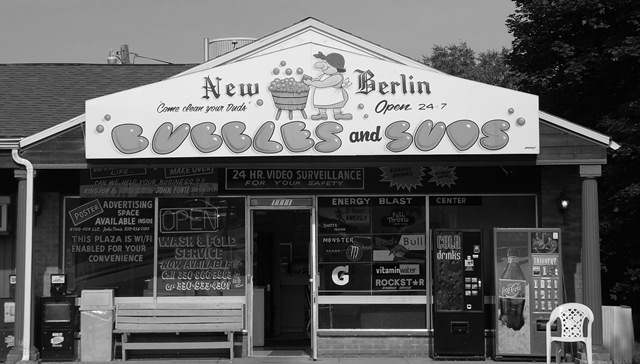 Today, only a hint of North Canton’s German heritage exists, a sign for New Berlin Bubbles and Suds laundromat. Place names are powerful symbols of identity, territory, and political power. We don’t know how the political tumult in Virginia—over the naming of a sea half a world away—will end. But, we have been here before. If not for the desires of a pair of corporations (which, combined, employed approximately 33% of their community), New Berlin, and its German roots, may not have been ‘wiped off the map’ of America. 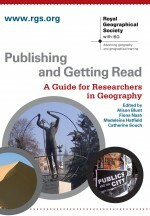 About the Authors: Chris Post is an Assistant Professor at the Department of Geography, Kent State University at Stark, Ohio, USA. Derek Alderman is a Professor and the Department Head at the Department of Geography, University of Tennessee, Knoxville, USA. This entry was posted in Area and tagged Cultural Geography, nationalism, Ohio, political economy, Political Geography, rescaling, symbolic annihilation, symbolic capital, toponymic on February 14, 2014 by RGS-IBG Managing Editor: Academic Publications.